It's a race against time in my studio at the moment - but I think I'm winning! I've just put the final finishing touches on the Ipswich Houses Project and it is all ready to rock! I haven't had a chance to photograph it properly yet though, just a few dodgy home shots, but will post images of the final work once it's all been photographed (by someone who knows what they're doing!!) In the meantime, here's a few little sneak peaks (above). One of my favourite pieces is a vessel that has an excerpt from the memoirs of Tom Welsby, the son of the original owner and builder of the house. His memoirs begin in 1863 with a vivid (and sensitive) recollection of the local indigenous people, who would congregate for days at a time on a field out the front of the house (now the Ipswich Grammar School). As a four year old child the scenes left a vivid and lasting impression on him. 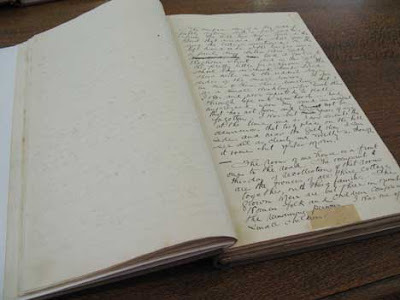 I was riveted by his recollections of life as a young boy in Ipswich in the 1860s, and pored over them for hours, all beautifully handwritten in a big old book in the collection of the Royal Historical Society of QLD. I'm really looking forward to seeing how the other artists involved in this project - jewellers, photographers, painters - have responded to their houses. A little bit of a wait though - the works won't be exhibited until 2009! Looking beautiful Mel- you're soooo talented! Thanks Bibbi, I definitely will. yes! I love the one with the script on it the best too! Your attitude and interpretation of a house, by going towards the soulfullness of the words written inside the house, makes me so pleased. I love, love what you made above. 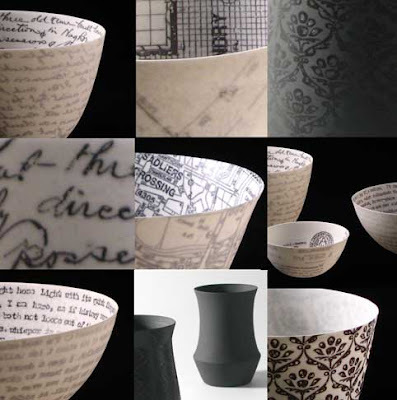 The inscribed text, inside the bowl, as if you understand that though all that writing is out on the book, hand on paper, it does come out of the inner self, and it does stain the inner walls of us, our words, thoughts--it does etch itself when we honor it. I love the whole thing. Can't wait ... to see more.